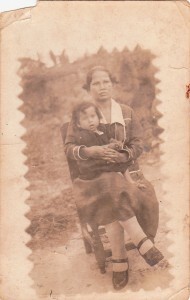 Bernarda Saenz and her daughter Maria Benedicta Angarita Saenz, two Colombian leprosy patients. 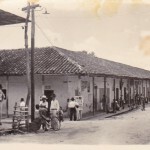 There were three lazarettos in Colombia in the nineteenth century. These were Agua de Dios, Contratación, and Caño de Loro. These were like townships where people with leprosy and their families lived. 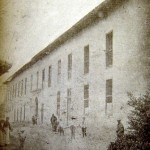 This building was known as Asilo Las Mercedes in the 1800s, and was later rebuilt as Agua de Dios’s main hospital. 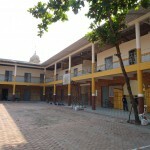 It has now been designated a National Heritage building. 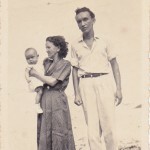 Three generations: Soledad Cortez de Devia, a resident of Agua de Dios, with her son Jose Guillermo Devia Cortez and his daughter Maria Ligia Devia Angarita, photographed in 1955. 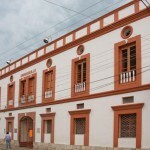 The Juan de Dios Carrasquilla building, a National Heritage site. 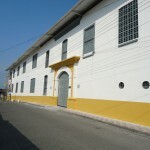 It was built as a hospital in 1918, and now houses the Museo Medical de la Lepra and Agua de Dios’s administrative offices. 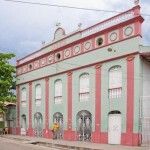 The Salon Teatro Vargas Tejada (Vargas Tejada Theatre), built in 1924 as recreation for the residents of Agua de Dios. It remains standing and is a National Heritage building. 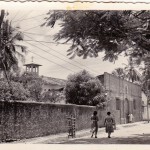 Older photograph of the Colegio Salesiano Miguel Unia, which served as a home for children with leprosy from 1899 until 1905. View of hills surrounding Agua de Dios. 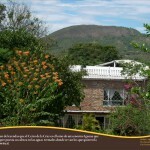 Local legends say that this hill, Cerro de la Cruz, is a huge sleeping iguana, with the hot springs at its head. 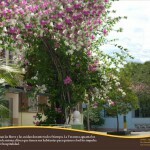 The residents of Agua de Dios tend flowers throughout the year. Identity card for a resident of the Contratación leprosarium. Photo courtesy of Mr Gonzalo Ruiz Arenas. Diana Obregón, “The State Physicians and Leprosy in Modern Colombia” in Disease in the History of Modern Latin America: From Malaria to AIDS ed. Diego Armus (Durham & London: Duke U P, 2003): 130-157. Abstract: Colombian physicians saw leprosy as an important area of inquiry in the late nineteenth and early twentieth centuries. In order to convince the government of the need to wage a battle against the disease, physicians unfolded a rhetoric where nationalist considerations as well as exaggeration played a principal role. They accepted the conclusions adopted at international conferences on leprosy, and adopted segregation as the only way to prevent the spread of the disease. The racist image of leprosy as an extremely contagious disease inflicting inferior peoples, arose from the imperialist expansion of Europe and the United States in the late nineteenth century when Westerners discovered leprosy in their colonial territories. 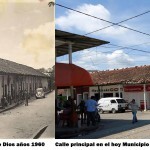 Between 1903 and the 1930s the Colombian government imposed several regulations ordering the isolation of the sick, and established special institutions for leprosy. Around this time, isolation continued to be the main strategy to manage the disease, but medical rhetoric began to change. Doctors regarded leprosy as a curable disease and rejected compulsory isolation. The emphasis shifted to prevention and research. This new approach was connected with liberal ideas that were dominant at that time in Colombia. As imperialist nations rediscovered leprosy in their colonial world in the late nineteenth century, Colombian physicians found endemic leprosy in their own country. The medical community was interested in constructing a national medicine to conform to ‘universal’ science. To medicalize leprosy, doctors provoked fears through exaggerating the number of leprosy sufferers to demonstrate that charity was incapable of dealing with the problem. The government approved laws of compulsory segregation of leprosy patients in the 1890s, while the 1897 international conference on leprosy held in Berlin gave international sanction to isolation. People actively resisted segregation as a violation of their individual rights. Dr Juan de Dios Carrasquilla studied the disease, experimented with serotherapy to cure it, and claimed that the flea was its agent of transmission. He combatted segregation and proposed instead a hygienic programme to improve environmental living conditions, but his approach was defeated. When the early twentieth century saw the consolidation of the Colombian state, modernization of the country became a national priority. The government started to take control of lazarettos, enforcing segregation of people, who were confined within an area circumscribed by a sanitary cordon. This strategy was a failure, since patients resisted segregation. An essay of an annotated bibliography on leprosy and leprosaria in Colombia, 1535-1871: social construction, representations and management. Authors: Claudia Patricia Platarrueda Vanegas and Catherín Agudelo Arévalo. 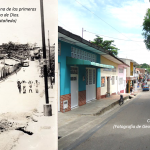 Between March and April 2002, we researched documents on leprosy in Colombia for the ILA Global Project on the History of Leprosy, under Diana Obregón’s tutorship. This increased our interest in the social study of leprosy through documents, and consequently, we decided to bring together our individual dissertation projects and construct an annotated bibliography, to obtain our respective Anthropology and History degrees. The research was directed by Diana Obregón and José Antonio Amaya, both lecturers at the Department of History of the Universidad Nacional de Colombia. 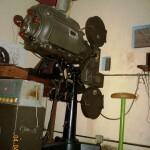 It was prepared between May 2002 and June 2003. The resulting bibliography was put forward by the examiners for the ‘Tesis Laureada’ award.. We believe that our research objective meets the ILA’s interest in the description of archives related to those places where leprosy has been endemic. When we first began the work, we built up a preliminary record of approximately 2300 printed papers on leprosy and leprosaria in Colombia, all produced from colonial times up to the present. This provided a way of identifying remarkable changes in the social management of leprosy and defining the chronological framework of the bibliographical compilation. We recognised a gradual process of construction of leprosaria, as well as the consolidation of rigorous isolation measures and the increase of medical authority on the definition of control practices for the disease. 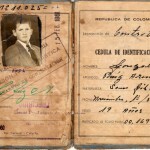 We read and recorded documents dated up to 1910, preserved in the libraries of Bogotá. At this point, we decided to impose more chronological restrictions, after realising that the number of items registered (close to 1200) exceeded the scope of the required dissertation. In the final phase, we limited the work to documents written between 1535 and 1871. During this period, a succession of governmental measures can be traced. These were promoted in order to found institutions for the assistance and control of leprosy. In 1871, the last of three Colombian leprosaria was founded, and remained throughout the twentieth century. The resulting bibliography presents 302 printed papers organized chronologically, which were produced between 1535 and 1871. It is the outcome of a rigorous revision of catalogues, indexes, bibliographies, legal regulatory compilations, serial publications, official reports and databases of libraries located in Bogotá. The catalogue focuses mainly on the capture of notions and categories related to pathological definitions (etiology, symptomatology, nosology, diagnostic, classification, therapeutic), representations (values, ideological concepts), models (charity, philanthropy, public welfare, science), practices (assistance, isolation), prophylactic prescriptions (hygiene, police), construction of hospitals and leprosaria (social conformation, infrastructure, administration, economy), and social relations (power, hierarchy, identity, resistance, territoriality). It also builds indexes of serial information on onomastics, toponyms, institutions, chronologies, editorials, legal regulations, fields of production and thematic contents. From Dust to Digital: Ten Years of the Endangered Archives Programme, ed. Maja Kominko (Cambridge, UK: Open Book Publishers, 2015): 259-292. 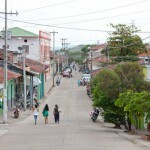 Platarrueda Vanegas, Claudia; and Agudelo Arévalo, Catherín. Ensayo de una bibliografía comentada sobre lepra y lazaretos en Colombia: Representaciones, prácticas y relaciones sociales. Bogotá: Universidad Nacional de Colombia, 2004. Encuentros. 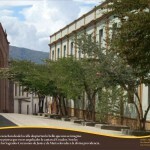 Colleción Tesis Laureadas, Facultad de Ciencias Humanas. 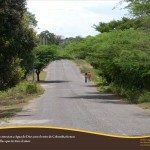 Platarrueda Vanegas, Claudia Patricia. La voz del proscrito o la exclusión desde adentro. Lepra y lazaretos en Colombia. Una interpretación antropológica. Tesis de la Maestría en Antropología Social. Facultad de Ciencias Humanas, Universidad Nacional de Colombia, 2006.